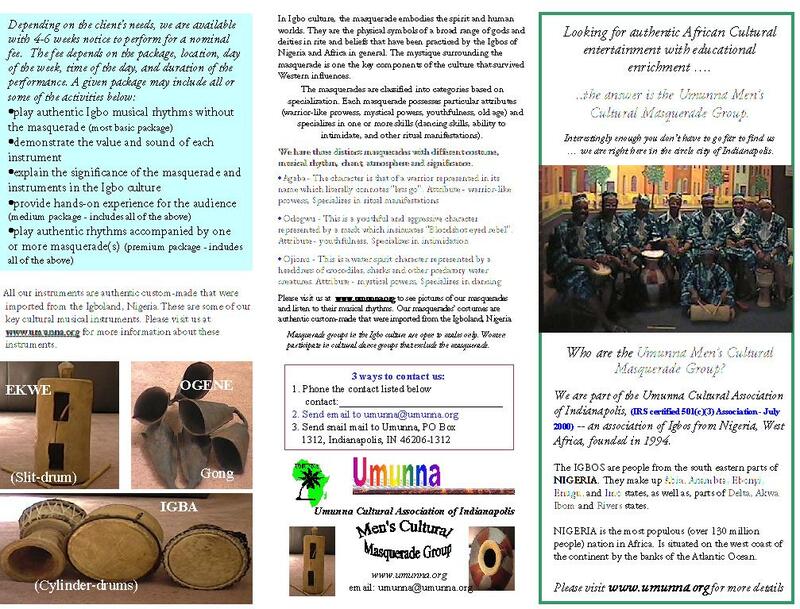 The Umunna Men's Cultural Masquerade Group is made up of male members of the association regardless of their age. The group is availabe to perform at any community or/and cultural events with at least 4-6 weeks advance notice. A typical performance may include all five items listed below. >> Provide hands-on experience for the audience. We live and enjoy our culture ... from the men's masquerade groups to the instruments we use. Not forgetting our women's cultural groups. We stay grounded in the culture we are so proud of. Listed below are some web links to get you involved. >> Authentic Igbo Musical Instruments. >> Please click here to download our brochure. It contains the key information about us and how to contact.